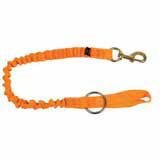 46" Orange Nylon Web Dual Position Saw Lanyard w/ Integrated Bungee & Bronze Swivel Snap. This saw lanyard allows you to reach out and make cuts while the saw is secured to your belt and when finished cutting attached the saw close to your belt via the integated 2" ring to an available snap on your belt. This keeps the saw close and tight when moving about the tree. Because of the integrated bungee the drop loop is kept to a minimum to reduce snaging while moving through the tree. Attached this lanyard to your saw by grith hitching the large lanyard eye through the handle or appropriate attachement point on your chainsaw then snap the swivel snap to an available ring on your climbing belt. ** Saw Lanyards should never be used for Personal Safety Use or Rigging Applications.